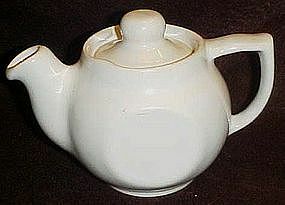 Cute vintage teapot that was most likely from a restaurant. Made of heavy white china, and individual size. Measures 4" tall, and marked USA. Flat sides I'm sure were for storage purposes in the restaraunt. Perfect condition. I have 2 available. Price is per item.